John Hart's equation for roundness, including clarifying comments by Michael Verity. If a round ball is moved further away in real life, it looks smaller, but it is still round. 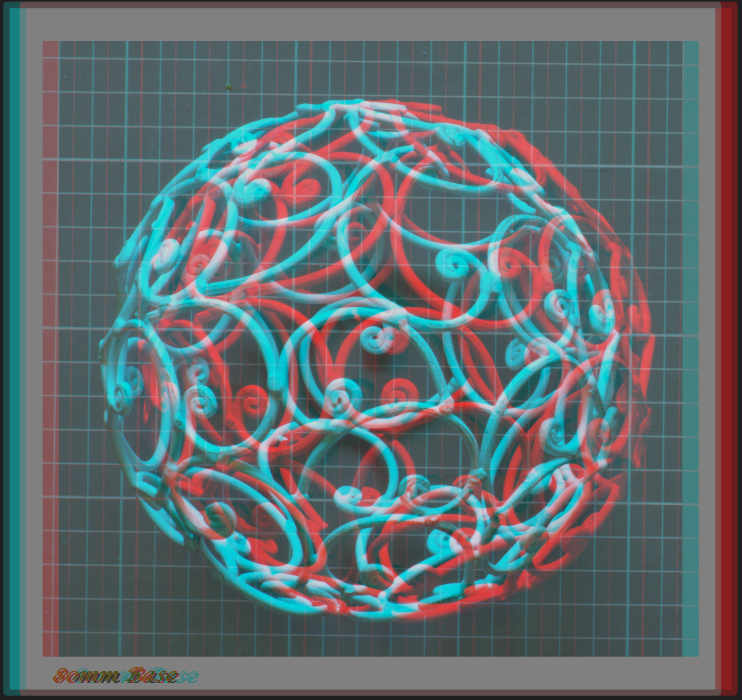 In a stereoscopic image, a round ball only looks round from one viewing distance. If the image is enlarged or reduced, the ball is still round, but only if you keep the same magical viewing distance. 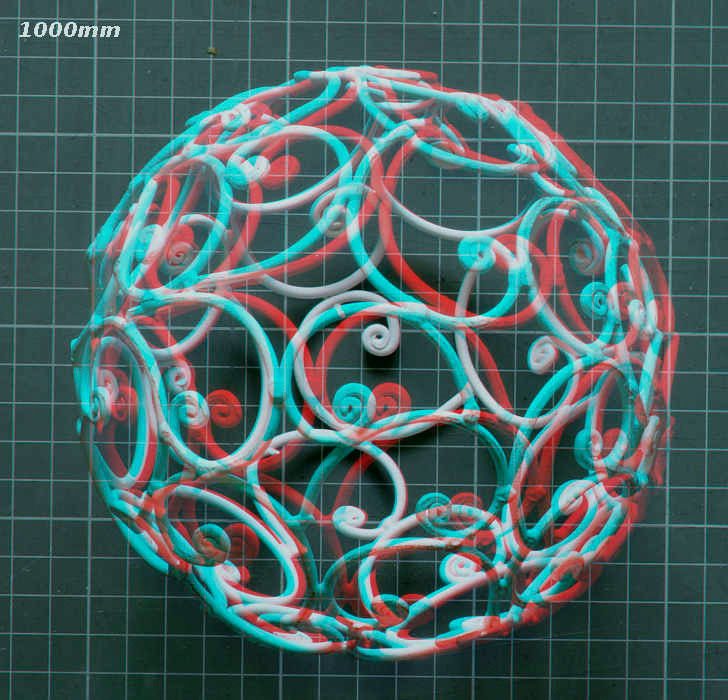 Viewing a stereoscopic image of a ball from further away makes the ball look deeper, so that a round basket ball becomes an elongated rugby ball. The picture, with everything in it, including the ball, looks smaller. By using floating windows to sink it into the screen, the ball stays round, despite seeming further away. But it looks bigger, even though the image has not been magnified. Read on to discover why this magic happens. I found the round mushroom tops sometimes failed to look perfectly circular when viewed in 3D. Other circular things came out oval, notably Charles Darwin's table discussed previously. An experiment on stereo roundness was needed. A sphere looks perfectly round in a stereo picture when the perceived depth is equal to the diameter of the sphere. A soccer ball should look round. 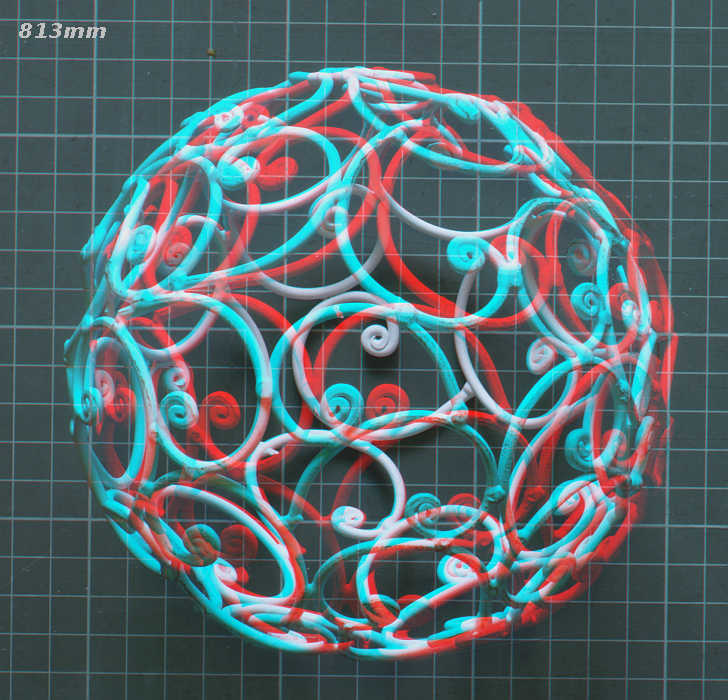 If there is not enough roundness in a 3D view, the spherical ball will flatten towards a hockey puck. Too much roundness and the soccer ball elongates into a rugby ball. This is the" sporting code effect" on roundness and becomes obvious when the above anaglyphs are viewed in stereo. n = Distance to the stereo window. Normally this is the distance to the nearest object, but in this experiment it is not. n, the distance from the camera lens to the nearest object, can be hard to measure in close-up photography. It is only approximately the distance from the front of the glass to the object. That is good enough for a simple magnifying glass, but a camera lens has lots of elements and is thick. The point we want to measure from is inside the lens at the first nodal point. How you find that point will emerge in the macro and panorama stereo photography sections. Beware, do not get confused between roundness and Maximum Acceptable Deviation (MAD) in a stereo picture. Roundness and MAD are often in conflict, as subsequent pages will show. Stereo base computed for perfect roundness is often NOT the most comfortable base for 3D photography. A computer screen or book page, viewed (V) from 1 meter or less, is not always the best distance to see good 3D. However, 1 meter is a very good viewing distance for close-up or macro 3D. 2 meters has been the usual viewing distance to aim for in amateur stereo photography. Projection onto a screen, 3DTV, or lens stereoscope viewing, give an excellent result (V around 2 meters). But now that amateurs see their results on computers, 3D images made for stereoscopes suddenly look flat. "Roundness" explains why this happens. Applying discs to "roundness" did not seem right. After hunting for a suitable sphere (and finding a globe not so useful, as I could not see through it) a wire art work was stumbled upon and gleefully purchased. The lens was an Olympus zoom, set to cover the parallel stereo shift , but I did not care what the focal length was. I aimed to use the grid to get the magnification on the computer screen at exactly 1:1, by changing the size in Photoshop. (A precision "digital zoom"). Exactly the same size was arranged on all four images. (The squares are 10mm on a 22 inch monitor running at 1680x1050 pixels. They may not be 10mm on your screen). The stereo window was set on the grid so that the sphere, as it "inflated and deflated" under the influence of a varying stereo base, did so on the screen surface. If the window were set at the front of the sphere, the grid would be jumping backwards and forwards. To keep the camera geometry consistent with the viewing method, the distance, n, was from the first nodal point of the lens to the grid. (The first nodal point had been found earlier while setting up panorama photography.) n measured this way, during photography, is consistent with measuring the viewing distance (V) from your eye to the screen surface. This measurement of V is easy to do. If I had taken n as the distance to the closest part of the sphere, there would be complexity during the analysis phase of the 3D picture. You would have to measure viewing distance to the front of the sphere, in front of the screen. Measuring to an illusion point in empty space may seem difficult at first, although it can be done with precision, as we will see later. A reasonable idea of the sphere diameter comes from comparing the transverse dimension with the 10mm grid. However that is not precise because the grid is behind the mid-plane of the sphere and is becomes too small for measuring the diameter, because of perspective. The John Hart analysis prefers the mid-plane measurement, but that is difficult during the 3D viewing phase. Three dimensional geometry in perception space, which is not Euclidean because of perspective, gets a bit complex. The analysis here is a "first approximation." Anaglyphs were made and can be checked for the correct viewing distance to provide perfect roundness, as described below with the images. Roundness in 3D is very sensitive to how far you are from the viewing screen. 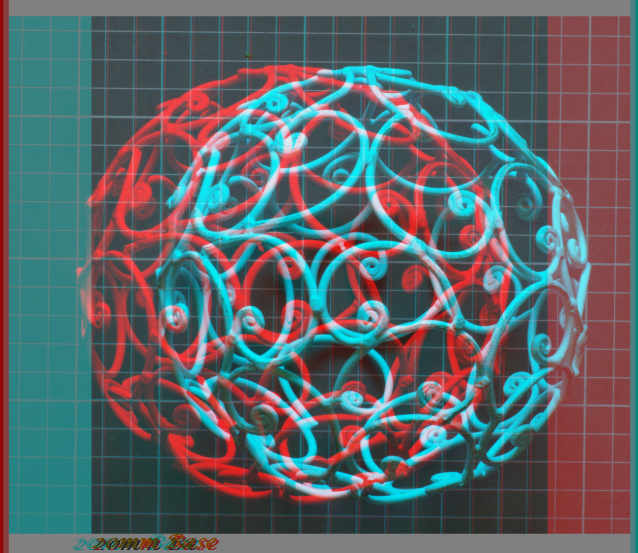 Try moving backwards and forwards, wearing your anaglyph goggles, until the sphere is spherical, just like a ball . A sphere should appear at 1000mm from the screen, if your eyes are 65mm apart, which is average. The grid has 10mm squares. If they are 10mm on your screen, then the scene is orthosteroscopic. That means the stereo anaglyph is as close as possible to reality. True roundness does not need to be orthostereoscopic. As long as the ball looks round, it is not distorted and its size is not important. Once the stereo pair have been photographed, roundness persists at any magnification, but only if you keep viewing from the same distance of 1 meter . angular parallax = 3.7 degrees. You are probably still looking at the screen from 1 meter but the sphere now seems deflated. Move back until it is a ball again and you will be sitting at near enough to 1600 mm from the screen. The magnification is the same as the 1000mm view example. Check by measuring the grid. Now the scene is not orthostereoscopic. The cameras have not reproduced the distance between your eyes, but are closer together, at 40mm, than even a child's eyes. You have to sit 1.625 times further away (65/40) . By moving back you have stretched the sphere in the depth plane (z) to make it round. Sitting closer, at a more usual distance, the sphere is flattened. Despite a change in magnification. 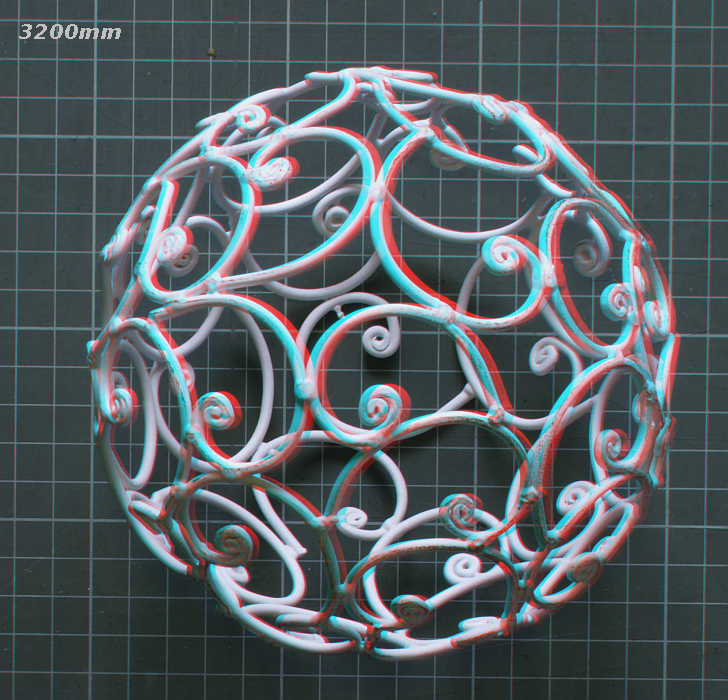 The experiment shows roundness, like perspective, is not changed by magnification of the image. u: Distance of the lens from the subject. E: Extension, or the extra distance the lens moves from its infinity position to focus the subject. n: Distance to nearest object, which is important in stereo photography. Final magnification on your computer screen depends on how much the receptor image is further magnified, (frame magnification) which gets complex if the image is both cropped and resized. No matter what magnification you view the sphere at, perfect roundness persists, as long as your distance to the screen (V) does not change. If you zoom into a stereo picture while viewing it (as you can easily do in a program like StereoPhotoMaker) roundness does not vary. Just as roundness has not varied here with magnification change. Perspective behaves the same way. The relative magnification of objects to each other at different distances in the scene does not change when you magnify the whole picture. A chair half the height of a table stays half the height as the image size changes. That is why a tiny digital camera can take a picture just as realistic as a large view camera photographing from the same position. Except the small camera result is more noisy, less sharp and shows a bigger depth of field. Magnification in photography is determined by focal length of the camera lens (combined with the extension needed to focus it), plus any change in picture size made during post-processing of the image. (Photographic magnification multiplied by frame magnification). The experiment shows roundness, like perspective, is not changed by magnification. That is the same as saying the focal length of the camera lens has no effect on these two indicators of depth. But it only works as long as the distance from camera to nearest object, n, is kept constant as the lens is zoomed. You need to ponder that because it is counter-intuitive. We are used to thinking that a telephoto lens flattens perspective. But that is only because you zoom in to magnify distant objects, which means you are photographing from further away than usual (n is bigger). We say that telephoto stereo causes card-boarding (which is the same as saying roundness has decreased). Again that happens because you usually take telephoto shots from further away (n has increased). If you use telephoto from further away, you must increase the stereo base. Twice as far away needs twice as much base to retain roundness (or no card boarding). BUT beware, because increasing the base can cause excessive stereo deviation, as we will see later. If you are back at 2 meters, the sphere has become an ellipsoid, like an egg pointing at you. 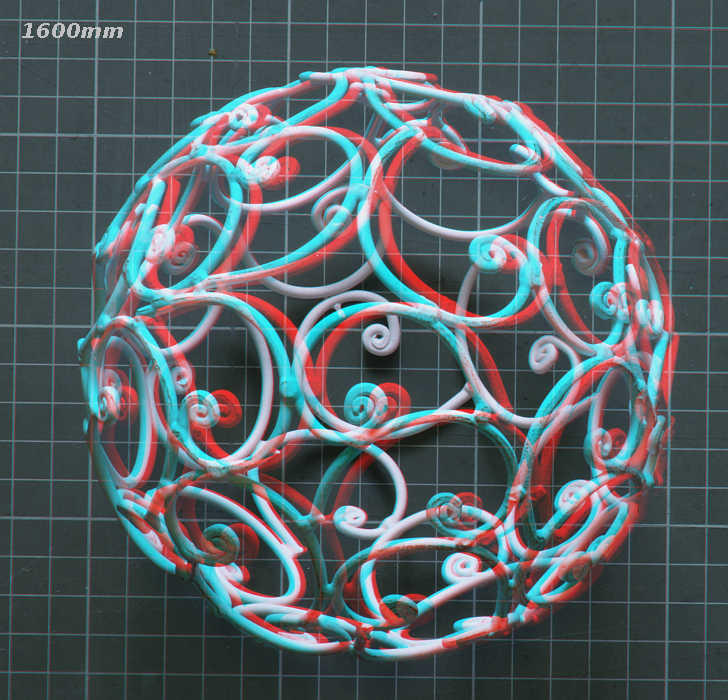 A soccer ball changes code to become a rugby ball. Getting it back to spherical means moving closer, to just over 800mm away from the screen. But only if your interocular distance is 65mm. Instead of the observer moving back, the stereoscopic image itself can be moved further away with floating windows. To my eye, the floating window experiment has failed to correct the lack of roundness. However, the ball looks bigger because I think it is further away, where it should look smaller. In truth, the image of the ball has not changed size and it is still sitting on the flat screen. Perceptually, the ball has retreated behind the screen and now looks bigger, because we think it is further away. But it has stayed just as flat as ever and measurement reveals it has not changed size. This is a good example of a stereoscopic illusion. It shows our perception of depth does not follow Euclid's laws of geometry. Depth perception is a learned experience and since it is an illusion, it is hard to measure. So how about trying to make the roundness worse by floating a sphere, good for viewing close up on the screen, forwards to where it might flatten? Floating the sphere forward should make the spherical deformity worse but to my eye it is no different. The back of the sphere has moved forwards, balanced by the same for the front of the sphere. Moving the stereo window forward or back does not help or hinder roundness. There seemed to be a pattern to the viewing distance required to make spheres look round. As a guess I thought the viewing geometry should be in proportion to the taking geometry. I decided to compare human measurements with conceptually similar camera measurements, by ratios. By rearranging the ratios, I attempted to predict the correct viewing distance from the camera geometry, by making the ratios equal. The viewing distances, V, predicted from this formula for correct roundness are shown on the top left of each image. Now anybody can check how far their eyes should be from the screen (V) to get the impression of a round sphere. The distances marked on the top left should be correct, if your eyes are 65mm apart. If your interocular distance (i) is much different from 65mm, it is necessary to run the formula to see if that gives you a better personal viewing distance. This experiment did not measure stereoscopic roundness, it is based on a binocular visual assessment. Olivier Cohen has since told me this was all done last century. I am delighted. That is not really the point since this is a learning web site, not a scientific paper and I do not claim to have discovered anything! For historic interest, I would love to know who did it though. Subsequently, I sorted out the mathematics for perceived depth and found everything stated here, based on perception, works out in formal geometry too. I can measure depth now. Geometry explains the way magnification (zooming) makes no difference to perceived depth and the way objects are stretched and squeezed as the viewing distance changes. See stretch and squeeze 2. I bet somebody else has worked all this out, I just cannot find where he published it! Viewing distance is the distance from your eyes to the screen. n is the distance in mm from the camera lens' first nodal point to the object which is to end up on the screen surface. This is frequently the distance from the camera to the nearest object, because when the stereo window is set during post-processing, the nearest object is arranged to be on the screen surface. In this experiment, the grid ended up on the screen and so n is the distance to the grid. Interocular distance is the distance between the observer's eyes. Obviously children and women have closer set eyes than large men, but the adult average is around 65mm. Stereo Base is the distance between the lenses when the picture was taken (mm). (Actually, measure from first nodal point of the lenses, to allow for any toe-in) . Formula for stereo base, B, to produce undistorted pictures. Re-arranging the ratios to give Base. This means that, while you are taking the stereo pair and aiming for perfect shape depiction (orthoplastic), the distance between the two cameras (stereo base) has to be set up differently, depending on how you plan to view the pictures. Stereo pictures are often not taken with the stereo base required for correct roundness (roundness = 1) on the viewing screen actually being used. Our experiment shows roundness changes as the viewing distance, V, changes. Roundness is also different for different observers, which is neglected when inter-ocular distance, i, is taken as 65mm for everybody. Roundness can be measured in terms of the stereo base used. will drop to 0.5 on a computer screen, viewed from 1 meter . I have a Zalman 3D computer screen and I like to view it from 1 meter (V), because closer than that the interlace lines become too obvious. A typical closest distance in stereo photography (n) is 2 meters (6 feet). This result is more interesting than you may realise. Digital cameras set up side by side cannot get the lenses closer than about 130 to 140mm. Some experts say this is no good for 3D, because the cameras are too far apart. Ah, but, they have not thought about roundness and viewing the results on a computer monitor. It turns out the 135mm stereo base for a pair of Sony V3 cameras is just right for computer stereo. SO computer users and projectionists end up having a fight! What is the roundness if we view a 3D picture, designed for computer viewing, on a 3D television 2 meters away? So; things looking perfectly round on a computer monitor, or when printed in a book, look twice as round as they should on a 3D television 2 meters away. If the TV is viewed from 3 meters, the roundness is 3, which is beginning to look ridiculous. OH NO it seems 1/30 rule is going to give you flat pictures, if they are to be seen on a computer screen! On a movie screen the 3D depth will be really excessive, if the 1/30 rule is followed. So the 1/30 rule is not always correct. The 1/15 rule for macro photography was derived in a very different way by Frank Di Marzio in the first edition of this web site. It was based on MAD and not roundness considerations. Now I want to view a 3D picture of my family on a television 2 meters away, instead of on my computer. The stereo base required to get perfect roundness is smaller. In fact it is exactly the same as the viewer's interocular distance. So the 1/30 rule is correct if you are viewing the stereo image from 2 meters - which was a very common distance before computers. Using a lens stereoscope, such as a Holmes viewer, people adjust the virtual optical distance to the stereo pair by changing the focus. They usually end up at a virtual viewing distance of around 2 meters, so the 1/30 rule has a wide application. Enhanced stereoscopic perceived depth or excess roundness has its place in scientific stereoscopy. I displayed solar spicules on the middle of the sun's disc by showing them, proprtionally, about twice as deep as they really are here.